“Sunset Vestige” debuts at Burton Chace Park. Now through July 1, visitors to Marina del Rey’s Burton Chace Park can view “Sunset Vestige,” a temporary public art piece reminiscent of the glow of a California sunset. 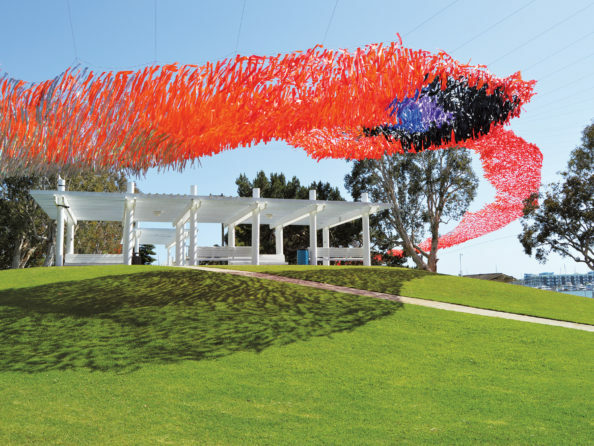 Created by local artist Patrick Shearn of Poetic Kinetics and funded by the Los Angeles County Department of Beaches and Harbors and the Los Angeles County Arts Commission, the piece consists of more than 40,000 suspended red, orange, black, silver and purple streamers that sway with the wind. Covering a 5,000-square-foot site next to the water, Shearn’s artwork is meant to evoke the phenomenon of “flocking,” where schools of fish or insects swarm or move together in the same direction. The use of transparent netting to hang the streamers creates the illusion that they are floating on their own. To engage the public, organizers are asking visitors to answer the question, “If this artwork could dance, what song would it dance to?” and create videos of “Sunset Vestige” with music. The videos can be posted on social media with #sunsetvestige. The most creative videos each week will be shared on Poetic Kinetics’ social media pages. Burton Chace Park is located at 13650 Mindanao Way in Marina del Rey.